I believe it’s a written rule that holidays must include cookies. 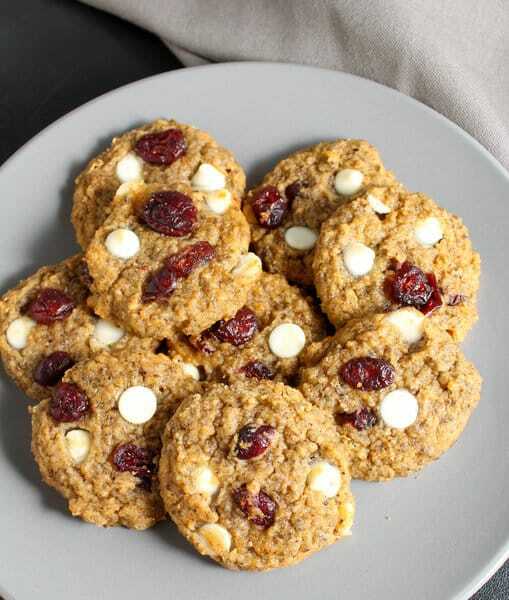 Particularly festive, winter-y flavored cookies like these white chocolate cranberry cookies. They’ve got a soft, chewy texture and are bursting with flavor. Everyone at your family dinner is going to want to save room for these sweet treats. 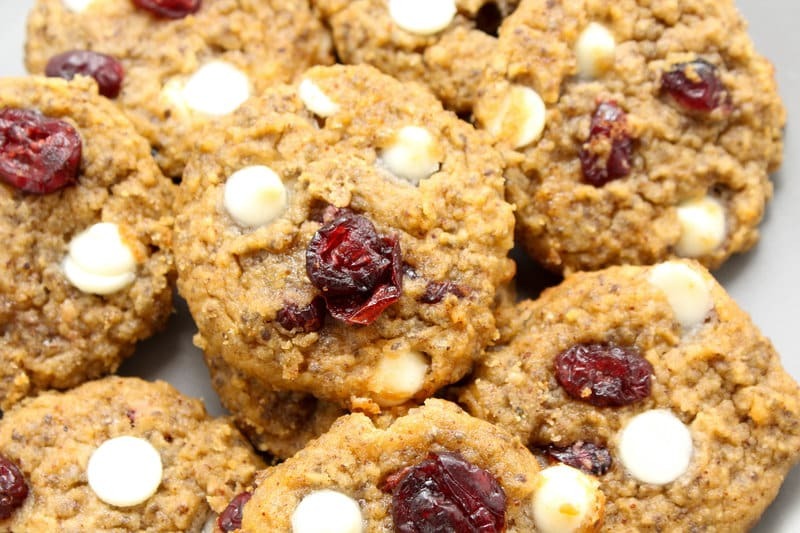 And these cookies will actually give you some other important nutrients besides loads of carbs that holiday meals are typically full of. 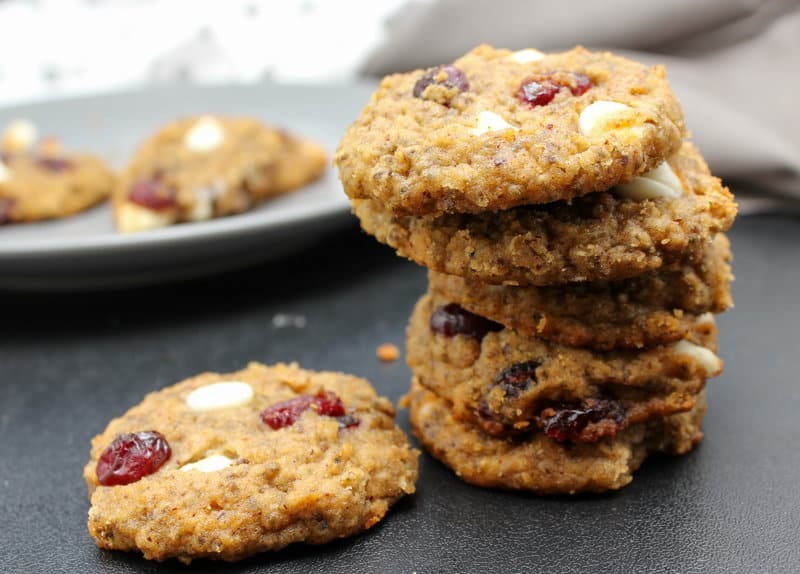 These grain-free cookies are made up of healthy fats and protein! 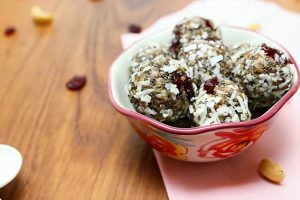 They’re so full of nutritious ingredients that they would even make a great surprise Christmas morning breakfast! I actually never left cookies out for Santa. Except for maybe one year, and I’m pretty sure that was only so I could eat the “leftovers”. But, really, what better way to stay energized throughout the crazy holiday season than with cookies full of good-for-you ingredients. All things that’ll keep you satiated and not reaching for the obligatory bowl of candy every house has during the holidays, amIright!? 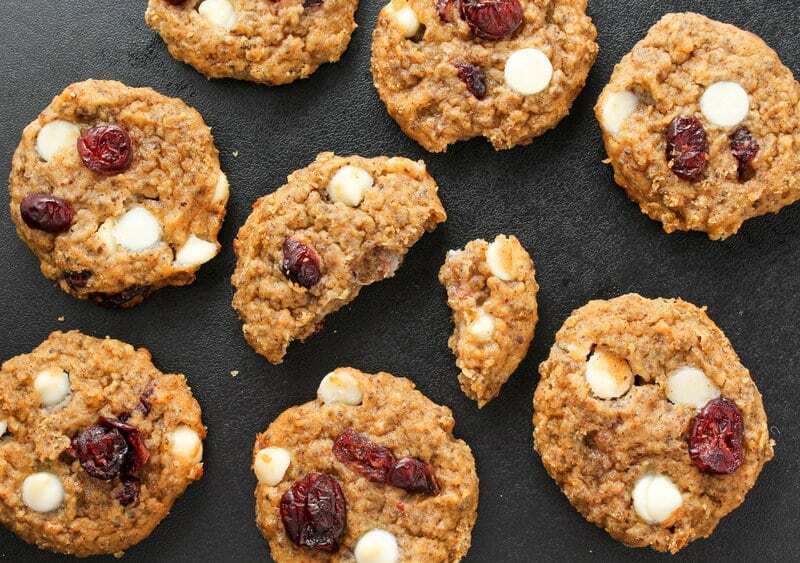 It’s not be April Fool’s Day, but I’m sure you could trick your family into thinking these white chocolate cranberry cookies were loaded with sugar. Surprise! They’re actually refined sugar free! Did you and your family leave cookies out for Santa or have any other holiday traditions? Preheat oven to 325 F and grease or line a cookie sheet tray with parchment paper. In a small bowl, stir together the chia seeds and 1/4 cup water. Set aside until all the water is absorbed. In a large bowl, add the flour, protein powder, baking soda and powder, and salt and whisk together. 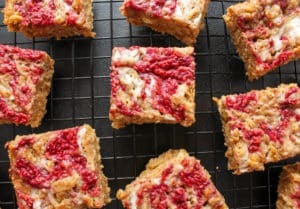 Make a well in the center of the dry ingredients, and add to it the agave, almond butter, 1/2 cup water, vanilla extract, lemon juice, and chia seed mixture. Stir together until well incorporated. Scoop out ~1 Tbsp of dough and place on the prepared cookie sheet. Flatten out the dough balls to about 1/2" thick. Bake for 12 min. or until the edges begin to darken and the center is springy to the touch (not wet). Allow the cookies to cool slightly on the tray, then transfer to a wire wrack to continue cooling.